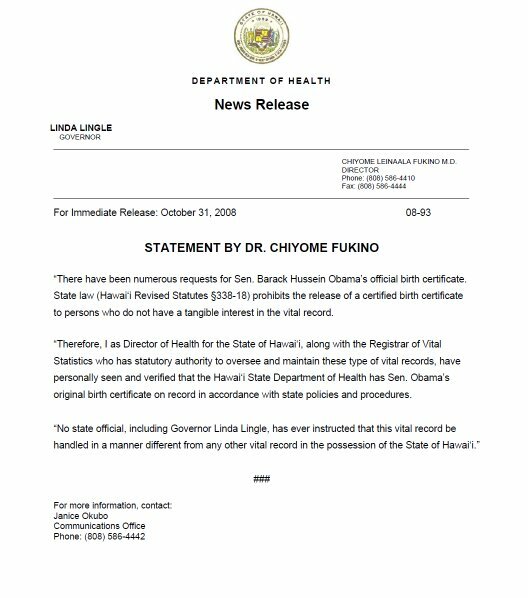 The following is the full text of the October 31, 2008 press release from the director of the Hawaii Department of Health, Dr. Chiyome Fukino. Nowhere in this press release does she verify that Barack Obama was born in Hawaii. The PDF is available at hawaii.gov/health/about/pr/2008/08-93.pdf. See also the full details on this issue at the Obama citizenship page. "There have been numerous requests for Sen. Barack Hussein Obama’s official birth certificate. State law (Hawai'i Revised Statutes §338-18) prohibits the release of a certified birth certificate to persons who do not have a tangible interest in the vital record. "Therefore, I as Director of Health for the State of Hawai'i, along with the Registrar of Vital Statistics who has statutory authority to oversee and maintain these type of vital records, have personally seen and verified that the Hawai'i State Department of Health has Sen. Obama’s original birth certificate on record in accordance with state policies and procedures. IMPORTANT NOTE: A picture of the PDF linked above follows; click the image for a larger version. It's important to note that the statement only mentions Lingle in passing; the statement is not from Lingle herself but is simply on Hawaii's stock letterhead. CNN and others have lied and claimed that Lingle verified Obama was born there, when she's issued no such statement.